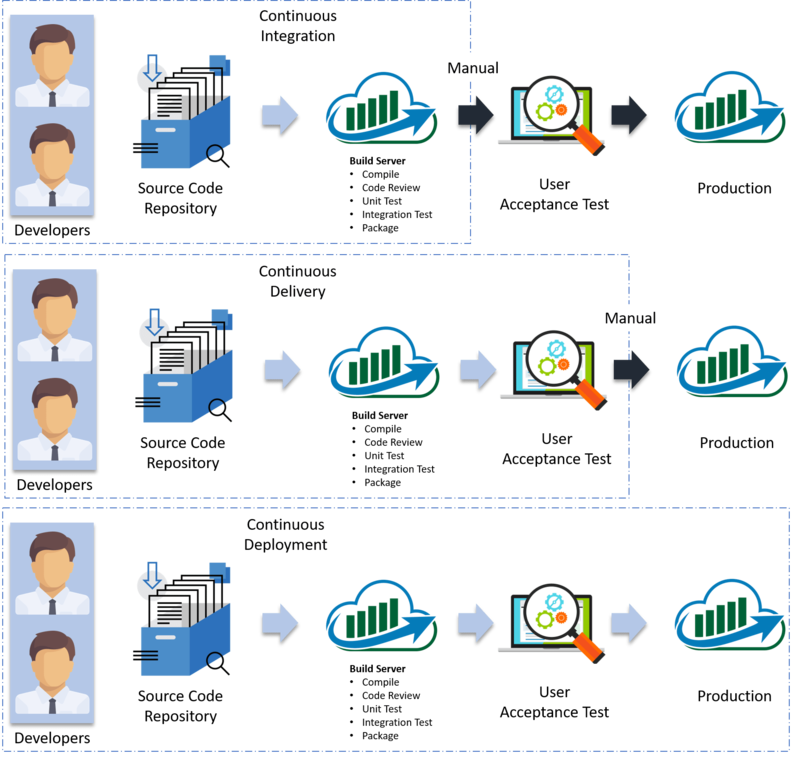 Learn how to set up continuous delivery with a Jenkins pipeline to continuously deploy your application as part of a DevOps process. Beta Testing: It is done by end users, a team outside development, or publicly releasing full pre-version of the product which is known as a beta version. The aim of beta testing is to cover unexpected errors. Now is the correct time for me to explain the difference between Continuous Integration, Delivery, and Deployment. In Continuous Integration, every code commit is built and tested, but, is not in a condition to be released. 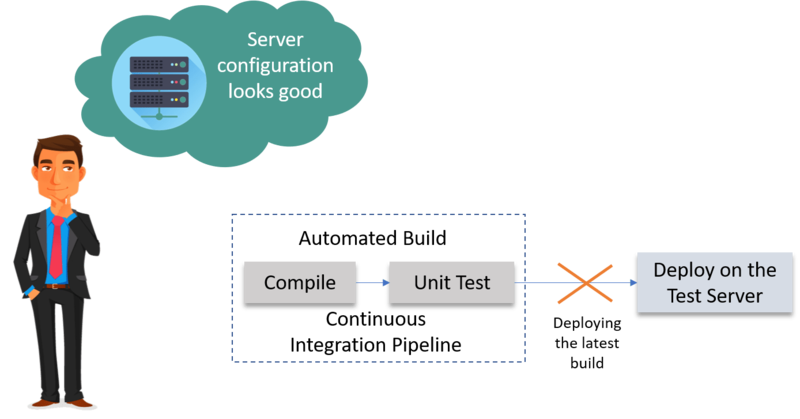 I mean the build application is not automatically deployed on the test servers in order to validate it using different types of Blackbox testing like - User Acceptance Testing (UAT). Let us understand this with an example. Imagine there are 80 developers working on a large project. They are using Continuous Integration pipelines in order to facilitate automated builds. We know build includes Unit Testing as well. One day they decided to deploy the latest build that had passed the unit tests into a test environment. This must be a lengthy but controlled approach to deployment that their environment specialists carried out. However, the system didn't seem to work. Well, the first reason that most of the people will think is that there is some problem with the configuration. Like most of the people even they thought so. They spent a lot of time trying to find what was wrong with the configuration of the environment, but they couldn't find the problem. Then one of the senior developers tried the application on his development machine. It didn't work there either. Without running Acceptance Tests in a production-like environment, they know nothing about whether the application meets the customer's specifications, nor whether it can be deployed and survive in the real world. If they want timely feedback on these topics, they must extend the range of their continuous integration process. Unit tests only test a developer's perspective of the solution to a problem. They have only a limited ability to prove that the application does what it is supposed to from a users perspective. They are not enough to identify the real functional problems. Deploying the application to the test environment is a complex, manually intensive process that was quite prone to error. This meant that every attempt at deployment was a new experiment — a manual, error-prone process. Enough of the theory — I will now show you how to create a Continuous Delivery pipeline using Jenkins. package — take the compiled code and package it in its distributable format, such as a JAR. deploy — done in the build environment, copies the final package to the remote repository for sharing with other developers and projects. The de facto standard for test reporting in the Java world is an XML format used by JUnit. This format is also used by many other Java testing tools, such as TestNG, Spock, and Easyb. Jenkins understands this format, so if your build produces JUnit XML test results, Jenkins can generate nice graphical test reports and statistics on test results over time, and also let you view the details of any test failures. Jenkins also keeps track of how long your tests take to run, both globally, and per test-this can come in handy if you need to track down performance issues. Go to the Post-build Actions section and tick "Publish JUnit test result report" checkbox. When Maven runs unit tests in a project, it automatically generates the XML test reports in a directory called surefire-reports. Enter "**/target/surefire-reports/*.xml" in the "Test report XMLs" field. The two asterisks at the start of the path ("**") are a best practice to make the configuration a bit more robust: they allow Jenkins to find the target directory no matter how we have configured Jenkins to check out the source code. Again, save it and click on Build Now. Now, in your Project Configuration, add the tomcat credentials which you have inserted in the previous step. Click on the plus icon to create a new view. Now we are able to continuously deploy our application on the test server for user acceptance tests (UAT). Published at DZone with permission of Saurabh K , DZone MVB. See the original article here.